I know, I know, I know. I've been making empty promises here, claiming that I will share more pics of the New Casa. I swear every time I just about wrap up a project and get ready to reveal it on the blog something happens. Like my husband and I will suddenly rip down a wall on a whim or decide to re-landscape our entire yard. These past 2 weeks it was the latter because, well, there was a 70% off sale at the local plant nursery, so time was of the essence. And since we are a 2 person show (with a wild child), things take time. So like a couple of nuts, we dug flower beds flanking 2 entire sides of our house and filled them with lots of flowering plants and foliage. It was much needed as our poor yard was completely barren with the exception of several large, beautiful trees. I must have flowers always and always, so we did the dang thing. Now our backs are aching but I'm seeing the beginnings of the whimsical and wild garden I envision. More on that later. I also made myself a blog schedule to force myself to share all of the ideas I have spinning around in my head. I love list making and structure and it was long overdue that I applied it to GypsyYaya as well. I adore blogging and creating and sharing, it keeps my creative juices flowing but I sometimes get bogged down with so many ideas that I can't commit to just writing a dang post. I have high hopes it's going to keep me on track. It already seems to be helping me carve out me time away from being the full time nurturer. I feel much more fulfilled and ready to be super Mom when my creative needs are being met. Self care is just so important isn't it? Funny how just an hour here and there can serve you so well. So that's my news. And these are some glimpses from around the house that are looking good enough to share. The fireplace and mantle recently got a coat of bright white paint. It was a very ugly brick with a orange wood inlay and mantle that all HAD to go. It brightens up the space so much since it is the living room centerpiece and it was really absorbing the kinda already scarce light. We're actually making a new more modern shaped mantle this week out of rustic wood. It will be a bit thicker and deeper to better suit the huge fireplace and to fit more of my vintage chachkies. 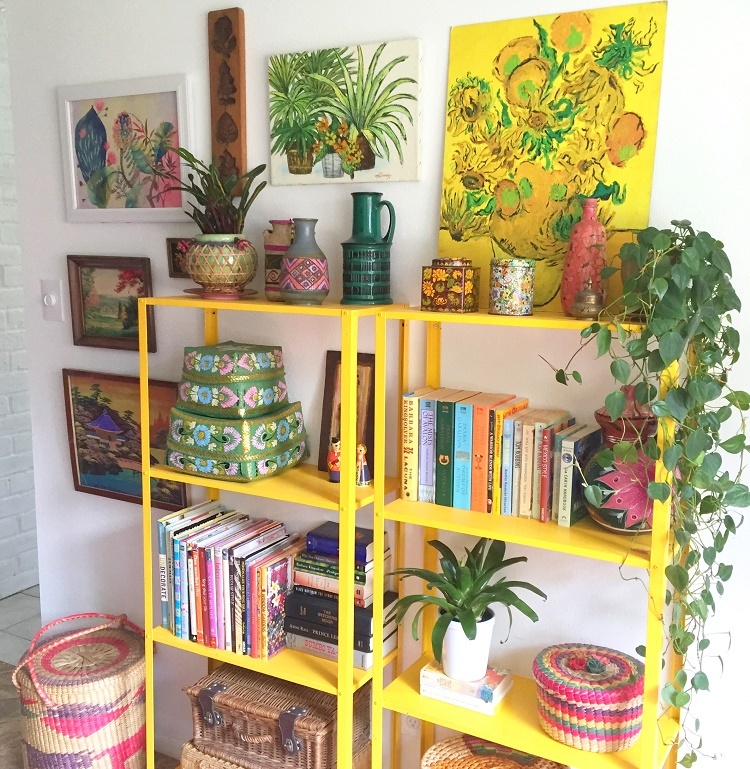 The yellow shelves from our past kitchen have a new home in our dining room. Since we only entertain in that room occasionally it serves as my studio and ground zero for my vintage shops so I didn't hold back with the color. I have officially started collecting botanical prints and have been hanging them all together there so I can be surrounded by flowers when I am working and they make for a whimsical dining space lit up with fairy lights and candles when entertaining. The last pic is of the awkward little space next to my back door. The other side of the wall is our kitchen and we just may cut a hole in it eventually and add a couple of rattan stools and create a little cafe atmosphere there. For now it's making sense as a little indoor jungle space with more plants to be added. The little green table and green lamp were both thrift finds at 5 bucks each and helped make a bland corner into something pretty. So that's what's up. A personality is starting to emerge from the rubble and things are beginning to look how I imagined they eventually would. Exciting! There's not much more satisfying than manifesting your vision into a concrete thing. Back with more soon. Thanks for hanging out with me ya'll, it means so much to me to have a creative community that appreciate what I do. Everything looks bright and cheery!